It has been 4 years since our house smell like baby shampoo and postnatal herbs. Umar is coming to 5 years old this year and is already in preschool. The house felt empty and too quiet once the children are at school. After finishing Masters in Ophthalmology in Dec 2012, we itched for a new baby, a new set of pitter patter in the house. But as the calling for hajj arrived in April 2013, we put the plan on hold, as my husband reassured me that we can always try for a baby later on, but a chance for hajj was once in a lifetime. Dutifully, I agreed. We came back from hajj Alhamdulillah in good health, in November 2013, and we decided to try again, for Umar's little brother or sister. This might be our last child, as age was catching up on me, and I had never had a baby after 30 years old. Medically I know that a woman's fertility will reduce after 30 years old but in Allah we trust. When we found out that we were expecting on 6th February 2014, we were overjoyed. Each and everyone of us couldn't wait to see the little angel's face. Umar in particular, loved to pat my non-flat-belly-from-previous-pregnancies and said, " I love you baby", and he did this on a regular basis. Several times a day, in fact. Fatimah, Dina & Umar all wanted a baby brother, so that Umar will have a friend to play with. The first glitch happened 2 days after that 2 lines appeared on the pee-stick. A small spotting, which in not unusual in my pregnancies. I was at a mukhayyam ("camping") in Bangi with the IKRAM sisters. I limited my movements, prayed hard, and went to Hospital An-Nur straight after the programme ended. Alhamdulillah the doctor thought it was implantation bleed and gave me some duphaston to strengthen the womb. No scan was done, as it was too early. After a week of MC for threatened miscarriage, no more bleeding and I went back to work. No oncalls, no operations to be done, I was put on light duty. The nausea and vomiting came along, albeit quite disruptive to my daily life but not unwelcomed. I knew it was a sign that my lil baby was healthy. My heart flutters with sparks of happiness with every thought of the growing baby inside me. Half me, half my husband whom I have loved for 13 years, and will love till eternity in shaa Allah. But happy days ended abruptly. I started bleeding at 6 weeks and 5 days gestation on the 24th of February. The bleeding was quite heavy with clots, and ultrasound scan showed an empty sac. A second opinion was sought after in Hospital Selayang few days later,and Dr Roslan the Head of Department reassured me that the baby could still survived and I was given a long MC. I rested in tears, scared but hopeful. My heart beat faster everytime I went to the toilet, praying hard that I wouldn't pass anything. Few days later I had another bleed, again soaking pads with clots, and I knew at that point that the baby was gone. I cried and cried, but my husband kept me close in his arms. Another scan confirmed that the fetal pole was there but there were no heart beat. I opted for conservative management as I wanted the baby to pass at her own time, and saved me from having a general anaesthesia. Almost 2 torturing weeks later, the fetus did not want to leave the comfort of my womb. I remembered there were nights when I would cry myself to sleep, asking my lil baby " why don't you want to leave me, when your soul is already in heaven?". Carrying a non-growing, non-living baby inside me was indeed too painful for me to bear, that I opted for a termination of pregnancy. 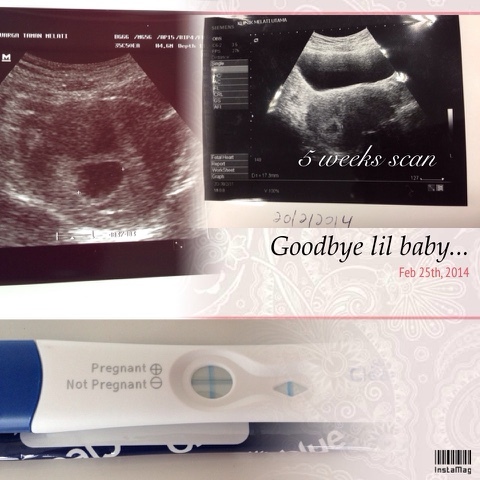 10th of March 2014, we had our very last scan of the baby. Somehow I knew it was a girl, as I was vomiting away not unlike when I was pregnant with Fatimah. As we walked into the clinic, I was still hoping for a miracle, that her heartbeat would be there. She was at a good 10 weeks size but she was quiet. No limbs visible, just a shadow, with no movement, and no heart beat, and to me, no more hope. My husband held my hand as I opted for cervagem, a pill inserted near the cervix to soften it & allow the product of conception to pass naturally. After 9 excruciatingly painful hours of contractions, I passed a lot of blood clots, and a scan showed that the womb has again, become empty. I was no longer pregnant. The baby sac was stuck at the opening of the womb, and doctor took it out & put it in a plastic jar, to be sent for analysis. As my husband wheeled me down to my bed again, I was having a regret for not seeing what's left of my "baby" in that jar. And I cried. Again. I was still vomiting that night. I was not sure if was the result of a residual HCG, or the pain, or the pethidine that I took for the pain. I was not able to eat, from the sickness & the sadness. I was drowsy, and I remembered clearly, there was one moment, which I was unsure if I was awake or asleep, I thought I saw her. Just a glimpse, but it was my baby. She's a bit bigger. About 2-3 years old, and she was wearing a beautiful white gown. She had straight hair in bob style, but I couldn't see her face. She was holding something which I believed was a small bouquet of flowers. And I told my husband this. He was gentle enough to entertain me. He asked where was she? And I answered, " I can't see where she was, but she is waiting for us in front of the heaven's gate". Two weeks after that, I still cried myself to sleep sometimes. From the grief, I developed painful shingles on my chest & back, adding insult to the injury. Four weeks after that, occasionally my husband would found me sobbing into my pillow. When he asked,I said I miss the baby. I really did. The recovery was slow. It was painful to me, more emotionally than physically. I thought I was being silly, but during my medical leave, I read a novel about a lady who was distraught as well after a miscarriage, so I thought I was only being human. My sister described it as "losing something that's already within one's grasp". Surely she can relate eventhough she is heavily pregnant with twins. I believe her. She was my rock during this emotional turmoil. 6 weeks after the termination of pregnancy, on the 24th April 2014, a new nightmare set foot in my timeline. I had a massive bleed or tumpah darah which nearly took my life. It was terrible, as I had described previously, it traumatized me so much to the point that I could not go to sleep. I was terrified I might wake up tomorrow morning with massive bleed. I was scared of our bathroom where my blood was dripping non-stop for two hours. I kept reliving the moments I collapsed in the car and I thought my time had come. My husband couldn't stop thanking Allah for letting me passed those dark hours when he thought he'd have to raise our 3 small children all by himself. I lost 1.5 litre of blood, and went to the Emergency Department in decompensated shock, and for me being here today telling this story? All praise to Allah who still wants me here to serve Him in shaa Allah. Before being discharged, I was scanned by a specialist and a consultant, reassuring me that my womb is empty. There were no residue of the previous pregnancy, and they put my final diagnosis as menorrhagia which was heavy period. Ironically after the life-threatening event, I was more at peace. The doctor said the massive bleed was due to the contraceptive medication, depo provera injection that I took one day after the termination of pregnancy. I decided to name our baby Maryam, and somehow I walked into the month of May with new sets of hope. My thought was, if Allah let me go through these ordeals , He must have cleansed my sins & He must have better things for me, as stated in the surah Al-Insyirah. 5. “Then, surely with hardship comes ease:"
6. “Surely, with hardship comes ease,"
I believe in Allah that nothing can happen except happiness for me. May was a brilliant month. I regained my full strength, I started exercising on my new cross trainer, and I was back to work 1 week after the ordeal. My medical students started a study with me, and I was significantly happy and optimistic. I resumed my teaching which I love, and I was just.. happy! 30th of May, the very last Friday of May, I had cramps in my belly and lower back pain since morning. I was the Master of Ceremony of our Annual Glaucoma Seminar and I was not feeling well. It crossed my mind to seek an advice from a fellow obestrician, but by noon, the cramps was gone & I went on with the seminar. At 6pm, after I reached home, as I sat on the toilet bowl, I felt that I passed something solid from my birth canal. A 4cm meaty lesion came out. With shivering hands, I scooped it out & put it in a bag. My mind was racing. "Was it a baby sac? It does look like baby sac. But is it a new thing or did I get pregnant again & didn't know it? If it is an old one, how can they miss it on the scan?". I was angry, sad, depressed and puzzled all at one time. I was scared that I'll go into another bleeding episode. I called my husband at work, who rushed home & took me to the hospital. A scan (again) showed an empty uterus, and surprisingly my pregnancy test was negative. The attending doctor did not think that it was a baby sac but obliged to sending to pathology for testing on my request. My beta HCG was negative as well. I went through the following week with my heart racing every now and then, waiting for the results of the pathology testing. I acted as if nothing has happened and I refused to slow down. I continued with work, and increased the intensity of my routine exercise from 5km to 7km run. This happened 12 weeks after the termination of pregnancy, when we plan to start trying again. It just ruined our plans. When the results came out, it was a baby sac! But the age was unable to be determined, hence from pathological point of view, they were unsure whether it was a new pregnancy or an retained product of conception from the previous pregnancy. At that point, I was just purely angry. I was angry at the doctor who scanned me and told me that my womb was empty. I was angry that a human error might have caused my massive bleed that nearly killed me. I was angry knowing that I might have had severe infection from the retained baby sac. I wanted to file a lawsuit but my husband said, "Human makes mistakes. Let us just be grateful that you are healthy now." I seek refuge in my usrah, my ex-schoolmate friends, and ultimately to Allah. I still hold on to the Surah Insyirah, and I recited it every single day. I believed there will be rainbows after the cloudy days. And I seeked professional advice. My first O&G consultant was Dr Hamid Arshat , my grand uncle, who thought it was a retained product of conception, that should have been picked up with careful scanning. He scanned me and printed a photo of my empty womb, and I believed in him. 100%. He said I can start trying again if I feel up to & advised me to take vitamins. The second O&G consultant I met was Dr Roslan. I have not met him again after my first encounter back in March. His opinion was similar. It was a retained product of conception , causing the massive bleed. He said depo provera would not have cause the massive bleed, but neither a normal 8 weeks gestation miscarriage. He said any miscarriage before 12 weeks, conservative management is in practice and they do not usually cause massive bleed. He also thought I might have got an infection from the retained baby sac (endometritis), and that might also cause the massive bleed, or a rarer differential diagnosis, an arterio-venous malformation in my womb. He advised for us to give another 3 months, before we start trying again. I was just relieved to know that I did not have 2 miscarriages consecutively. Somehow talking to these two nation-renowned obstetricians helped me in coping with my loss. I can finally close that chapter of my pregnancy. I am now a para 3+2. Three living children for me to love and to hold in my arms, two in heaven, for me to love and to hold in my heart. Today is the 26th of June, 3 days before Ramadhan. It has been 15 weeks since my miscarriage. If I am still pregnant, the baby would be in the 23rd weeks of gestation. I believe that "this too will pass". I believe that baby Maryam loved me so much that she did not want me to forget her, so she left me with reminders of her. Dr Roslan said sometimes in incomplete miscarriage, the baby part would have detach, but the placenta part could still be attached to the wall of the womb, making it difficult to be seen on the scan. I choose to believe him. I named you after the noble lady, who's name is being repeated over and over again in the Quran, the virgin mother of Nabi Isa Alaihissalam. I named you after my best friend whom I love so much to this day. I named you the name Mak Tuk has always wanted to name one of her granddaughters. Darling, today, 3 days before Ramadhan, I hope I have found closure. In the last 5 months, there was not a single day that I don't think about you. You might be the very last person ever reside in my womb, and I hope we will meet in heaven, my love. I love you so much that sometimes I cannot comprehend myself. I will always tell Kakak Fatimah, Kakak Dina & Abang Umar about how special you are, that you never set foot on earth, but you go straight to heaven. I will always remember you but I have to let you go. I have to attend to your siblings, teach them Quran, teach them about Islam, so that we can all be reunited in the hereafter in shaa Allah. I have hold on to your memories too long that it keep bleeding my wounded heart. Now I must learn to let it heal. Rest in peace, my little child, for from Allah we came, to Him we shall return. When we meet in Jannah, there will be no more pain, sorrow & fatigue, as promised by Our Lord Allah Al-Mighty. Moga cepat dapat baby baru ye kak..
Don't be sad.. Kita ada saham akhirat bersama anak yg gugur tu.